The Anime Archivist: Video Backlog: "Iron King"
Story Outline: Gentaro Shizuka (Shoji Ishibashi), singing cowboy extraordinaire, is actually a secret agent National Security Organisation on a mission to thwart the plans of the Shiranui clan to bring down the Yamato clan. Which is uh, the current 1972 Japanese government. Along with a transforming giant cyborg called Iron King they defeat wave after wave of the Shiranui clan’s giant robots. Naturally Gentaro has a multi-purpose weapon called Iron Belt which he can transform into a lance or a whip, which he usually whips the giant enemy robots with or uses to climb aboard the robots (or more often ends up dangling from said robots while the robots angrily try to shake him off). Early on the story Goro Kirishima (Mitsuo Hamada), a rather wimpy and weak looking man is sent help Gentaro much to his initial disgust, though he two of them soon become best buddies. Gentaro doesn’t understand why Goro disappears when Iron King shows up or why he drinks so much water afterwards (Iron King requires water to run). A bit thick, our Gentaro. Joining them early on in their journey is the rather cute Yukiko Takamura (Chieko Morikawa), but is she a spy? After the Shiranui clan are defeated, the next two enemies are the Phantom Militia and the Titanians. 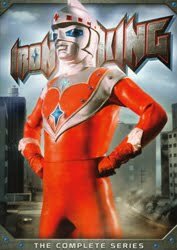 Mini Review: So it's a rip off of Ultraman mixed in with a bit of Kamen Rider to a degree. Gentaro’s singing is annoying, though in the middle of the series it goes away, only to return with a vengeance unfortunately during the last part of the series. Goro is a complete is a nerd and quite an unlikely Iron King, but he’s quite a decent character. Gentaro is a bit of a prick really. A bit of a misogynist. Kind of disturbed at how most women in the show are slapped by Gentaro or die at the hands of the enemy (or both). Lots of lapses in logic, but hey, it's an early 1970's kids show. And where else could you see a bull and horse explode? (not graphically, but in a cheap 1970’s special effect way). Stupid dopey fun, but a bit repetitive at times. The gross stupidity and lack of logic and sometimes continuity make it a real hoot though. 7 out of 10.